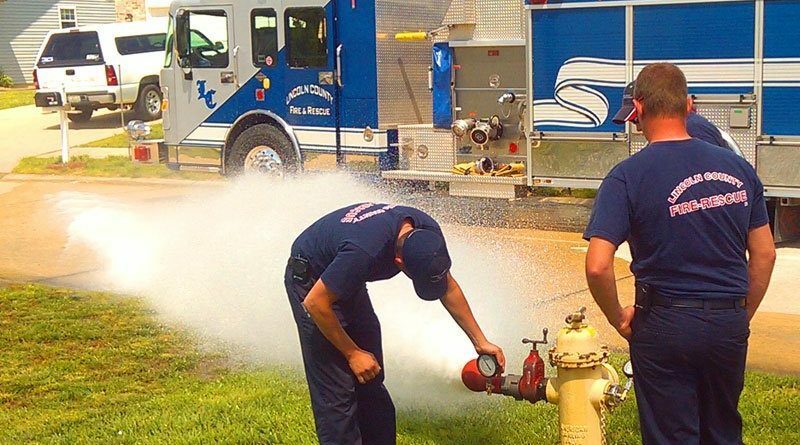 On Monday April 8th, 2019 Lincoln County Firefighters will begin annual testing of all fire hydrants in the City of Troy, Moscow Mills and Public Water Districts 1 and 2. The testing consists of flowing water through each fire hydrant, measuring the flow and collecting necessary information about the water system. This testing helps prepare for fighting fires in all areas as well as maintain and enhance the Fire District’s current insurance rating which directly affects the cost of homeowner’s insurance premiums. The most common problem encountered by residents is the temporary discoloration of water supplying homes and businesses in the immediate area. Although the water remains safe for consumption, the water may have an orange or brown coloring. This coloring is usually caused by a high volume of water flowing through the underground pipes which dislodges tiny rust particles. This problem is usually resolved after fire hydrant testing has stopped and water is run in the home or business for a short period of time. Discolored water may stain light colored clothing and we recommend running the water first to ensure clarity before washing laundry. The testing will typically last approximately 4-6 weeks and occur Monday through Friday.